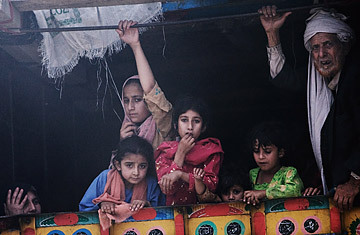 Buner refugees look out of a truck as they flee fighting on May 6, 2009, near Swabi, Pakistan. Hundreds of thousands of Pakistani people have fled their homes due to fighting between the Pakistan army and Taliban forces in the Northwest Frontier Province. Is a Better Government Possible in Pakistan? It is in refugee camps like Chotha Lahore, rather than on the battlefields of the Swat Valley, that the outcome of Pakistan's decisive showdown with the Taliban may be decided. The camp, near the town of Swabi, is sheltering some of the hundreds of thousands of Pakistanis displaced by the government offensive to drive the militants out of the Swat Valley and its surrounds. "The purpose [of the campaign] is to cleanse the areas of these miscreants and militants," Pakistan's Foreign Minister Shah Mahmood Qureshi told TIME. "It will go on until it achieves its objective." But the Pakistani public's revulsion at the abuses of Taliban rule in the area could be eclipsed by anger at the catastrophic toll inflicted on the local civilian population by the military's campaign to oust the militants. Yousaf Said Ghawaz, a shopkeeper from Mingora, waits with 30 relatives to be allocated one of the lime-green UNHCR tents scattered across an open field. "My mother is ill, she has a heart problem," he says. "Who will help me?" Under the Taliban, he was threatened with violence if he continued to serve female customers. "They are brutal people; you cannot imagine what they were doing. They would drag people out of their houses, behead them in the public square and leave a note saying that the body could not be removed so that it would serve as a warning." Still, he is also fiercely critical of the army and the government, saying that when it was time to fight, "they made peace deals." And now they are finally fighting, he adds, "innocent people are dying from mortar shelling." Previous Pakistani efforts against the militants have faltered on the military's overreliance on heavy-artillery barrages  a symptom of it being trained and equipped primarily for conventional warfare against India. The inevitable civilian casualty toll from such operations has quickly eroded local support, alienating even those who had initially welcomed the army's arrival in Swat. Moreover, the Pakistani authorities' handling of the displaced population could even exacerbate the security situation. Nine months after the military moved against militants in the Bajaur Tribal Agency, tens of thousands of people displaced by that operation still languish in squalid camps around the northwest, with little prospect of returning home any time soon. "There are almost a million people already displaced," says Foreign Minister Qureshi. "The government is making preparations, but we will need assistance from the international community." The crisis of the displaced not only threatens to turn public opinion against the government, but also creates a political opportunity for extremist groups. In the aftermath of the 2005 Kashmir earthquake, the government proved ineffective in delivering relief to those affected, and the vacuum was filled by Jamaat-ud-Dawa  deemed a front organization for the Lashkar-e-Toiba militant group and since banned; the group won considerable prestige for its relief efforts, which raised the political risk of clamping down on it. "The longer the crisis continues, the more difficult it will become," says Hasan Askari-Rizvi, a respected military analyst. "It will make the humanitarian problem more acute and criticism of the operation will rise." The government, meanwhile, is claiming early successes in what it has defined as a decisive battle for the country's future. Troops backed by helicopter gunships, fighter jets and artillery have pummeled militant positions in and around the Swat Valley, and claim to have already killed some 700 of the estimated 4,000-5,000 Taliban fighters believed to be deployed in the valley. Militant training facilities and supply lines have been disrupted, and some key local-level Taliban commanders have been killed. "I think this time there is a far greater resolve, far greater determination, and the army is far better prepared," says Talat Masood, a retired general turned military analyst. "I think they understand what is at stake." But, he warns, "It is going be a long battle. It's going to be very messy. It will be bloody." The guerrillas are battle-hardened and well-trained; supplemented by veteran fighters who've seen action in Waziristan, Central Asia and Kashmir; and are at an advantage in the rugged terrain. Fierce fighting is expected in the narrow alleyways of Mingora, and previous experience suggests that if the army musters overwhelming force against them, the militants tend to retreat into the valley's snow-capped peaks, beyond the military's reach. "Perhaps the military can clear the cities in a few weeks," says Askari-Rizvi. "But how do you deal with them if they retreat to the tribal areas or the mountains?" A key challenge for the Pakistani authorities will be maintaining public support for a protracted campaign. Widespread revulsion at the Taliban's brutal tactics and its open defiance of the terms of its truce with the government and steady advance across the northwest have prompted many Pakistanis to back the military campaign. "There is unanimity in Parliament and the public opinion in Pakistan has convincingly turned against militancy," says Qureshi. "Even the religious parties are speaking out now." But the Foreign Minister may be overstating the public consensus  while there has been widespread condemnation of the Taliban, even key opposition leader Nawaz Sharif has stopped short of full-throated endorsement of a military campaign to wipe out the militants. The former Prime Minister, who is currently Pakistan's most popular politician and is being wooed by Washington, may, like many in Pakistan, be hedging his bets.